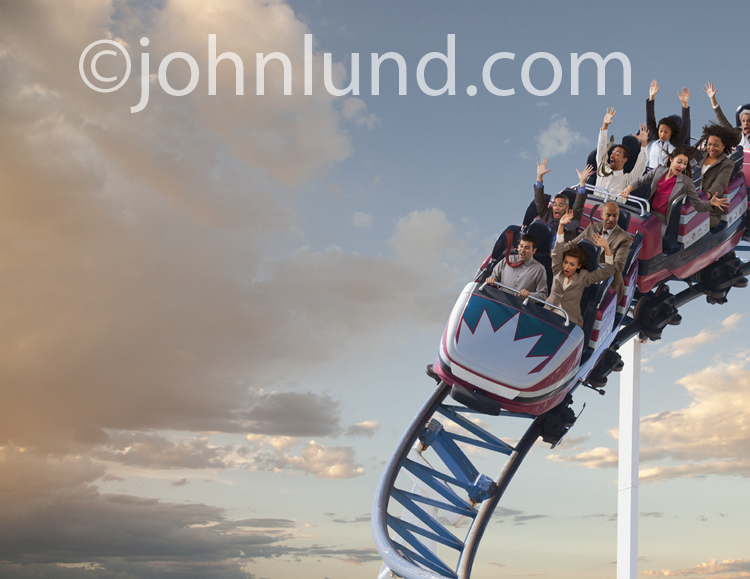 A transitioning industry such as stock photography business results in a wild roller-coaster ride! Both stock photographers and stock agencies everywhere are missing out. Traditional stock photographers are missing out on the huge audiences of the microstock agencies. Microstockers are missing out on the higher prices of traditional stock. Clients are missing out by not having access to a full range of visual solutions. While a lot of “solutions” have been offered up, the real solution, the only viable solution, is happening slowly but inevitably. Microstock agencies are slowly bringing higher priced content onto their sites whether through the addition of content from traditional agencies, or through the addition of higher priced content. In the case of iStockphoto.com, their higher-priced content offering, Vetta, has also been migrated onto the Getty site. As far as I can figure out, at this point, the biggest difference between high-priced stock photos and low-priced stock photography is the price. It may be that traditional and microstock agencies can successfully create different price brands that hold up…time will tell. I wouldn’t be surprised to see the lower prices climb a bit and the higher prices continue to fall…though I hope not. It also seems that traditional agencies are starting to clean out material that hasn’t sold well, or at all, and are moving that work either into lower priced collections. Getty is culling out material from its RM collections that hasn’t sold in three years and moving it into RF collections. Getty is also running a campaign pointing out the value of RM material by the work and resources that go into the images. I do think that RM will continue to exist, but primarily for high-end advertising use. Someday, probably sooner rather than later, all the different collections will be available to all audiences at various price points. Hopefully photographers will see the wisdom of putting better images into the higher priced collections, though it is inevitable that the lines will remain blurred as photographers struggle with the decision to go for the volume sales or to go for fewer but higher priced sales. My own strategy is to go for both while avoiding the very lowest price points. Right now I would advise all photographers contributing to stock photography to do their best to get images into higher priced collections. From what I have heard from the photographers I know who participate in microstock (hearsay only…), the higher price collections are where the real money is. I also know from my own experience that the images I have in TAC (The Agency Collection) that are on both the Getty site and the iStockphoto.com site, are earning extremely well. I can’t say yet whether images will earn more than similar images in RF or RM, but it does look promising. Keep in mind though, that those TAC images are being licensed at traditional RF prices, not microstock prices. There is another area in which we are missing out as well. I get contacted several times a week by individuals wanting to use one of my images on their blogs or for some other personal and non-commercial use. Unfortunately there is no provision for such uses by the traditional stock agencies…at least not at rates that make sense for those individuals. It is my belief that the market is in transition to sorting itself out. The bummer is that we don’t know what it will eventually look like…or how long it will take. In the meantime we just have to keep producing, improving our work, and doing our best to get the work distributed as effectively as possible. 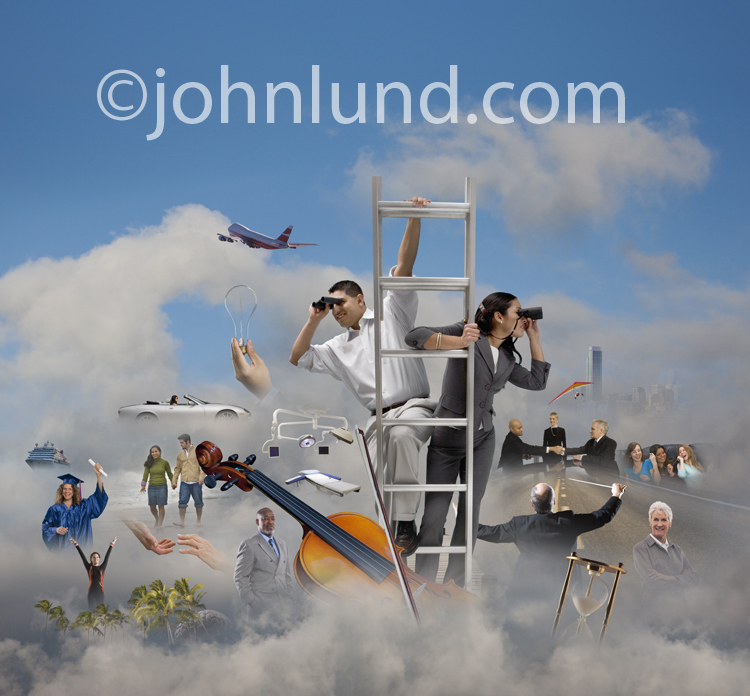 Cloud computing, online storage,internet searches and teamwork are the concepts illustrated with this stock photo. To insure a healthy career in stock photography it is vital to create images that the market needs, and it is even better if you create images that do not yet have a lot of competition. It is with that in mind that I recently created a new image about cloud computing. The idea came about because of the current buzz about the Internet “cloud”. Online computing, and storage, has been touted for years, but I definitely get the sense it has finally arrived and is poised for tremendous growth. It seems obvious that the need for imagery dealing with the Internet cloud is going to be significant. The question then becomes, for me, how can I shot that concept in a clear and versatile way? The obvious visual is in the use of actual clouds. The challenge then becomes to use an actual cloud in a way that isn’t too corny, and that makes sense. As I mulled that over in my mind I pictured a eye-level cloud image filled with the things that one might look for on the internet, and that can be symbolic of the kinds of things that are both stored on the net and that can involve online computing…things related to medicine, music, travel, business and so forth. I started by combing two different images of clouds and one image of fog that looks like eye-level clouds. Once I had the background composited together I looked through my archives for images that could symbolize music, business, travel and so forth. I stripped out the various objects in Photoshop and pasted them into the cloud image. When I came across the image of the man and woman on a ladder and searching the horizon with binoculars, it occurred to me that the inclusion of that picture would add the element of the “search”…online searching…to the image. That would broaden the appeal of the stock photo to a much wider audience. The image then becomes about using the cloud and/or searching the cloud (Internet) and even teamwork. The couple standing on the ladder also added a nice “action” element to the image. I crafted the photo so that it can be easily cropped to a vertical, say for a magazine cover, as well as a horizontal or square. I believe in creating stock photos that can be as flexible as possible for as many potential users as I can. The biggest drawback to that approach is that the image might not always have as much “cropping” impact as otherwise, so it can be a bit of a balancing act. A group of three teens socializing can represent social media, business people shaking hands adds a solid business angle, an operating room says “medical”, and a cello contributes to the music aspect. A conductor adds to the teamwork meaning, a variety of age groups are included and a pair of hands about to touch adds the element of “connection”. In this stock image I had to decide when to stop adding elements in order to not create too much clutter. Having just had a client license three images for 4,200 Euros each, and non-exclusive at that, and in the interest of diversity (I already have several cloud computing images in RF collections), I am placing this image into a Rights Managed collection. It is always a challenge to figure out where to put images. To you go for the most eyeballs, or the larger sales? Even though a lot of my RM fees end up actually lower than RF fees, my individual Blend RM sales are averaging close to three times the size of the RF sales. So with no clear knowledge of the best way to go…I do my best and diversify. I do believe that with the right images well distributed, you can’t really go wrong.